Here's one of my crazy purchases from the thrift shop! Even though the sentiment "BEER Helping White Men Dance Since 1867" is pretty funny, it's just not a sign I really want in my home. 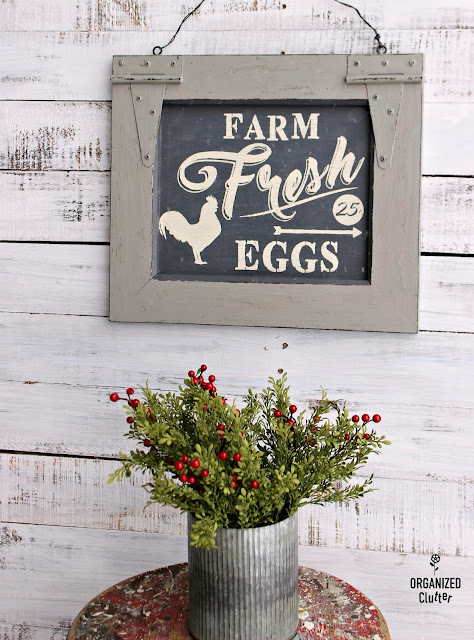 Let's give it a farmhouse makeover! I love the hinges on the frame. First, I taped off the frame inside edges with blue painter's tape, and painted the center with Annie Sloan Chalk Paint in Graphite. I used two coats. 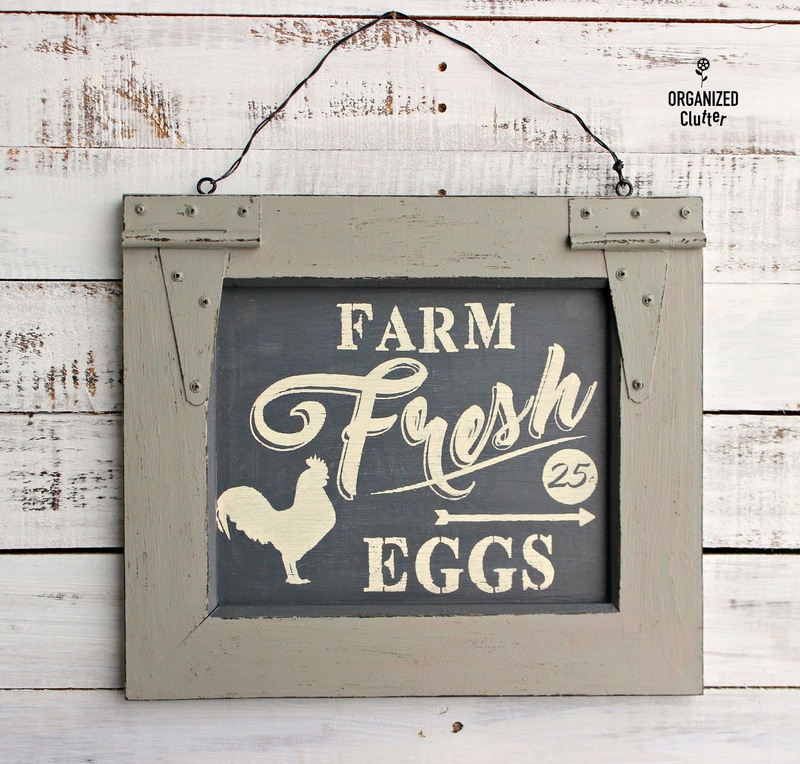 The frame is then painted with Chalked Paint in Country Gray . I brushed on two coats. A while back, I purchased this Mesh stencil from Hobby Lobby. Since the stencil is mesh, the finished project is supposed to look silkscreened or hand painted as opposed to stenciled. The mesh stencil was only $7.99 so I thought I would give it a try. The mesh silkscreen almost fit perfectly in my beer sign's center. The mesh is very flexible. The silkscreen is adhesive backed so it stays in place. I brushed on Ceramcoat Acrylic Paint in Light Ivory with a small sponge brush. No pouncing. Just don't use too much paint so it sneaks under the mesh. Press somewhat lightly. Directions come with the stencil. I very lightly sanded the silkscreen with a small piece of 220 grit sandpaper. If you had any mistakes or bleed under stencil, you can clean this up with sandpaper too. Then I wiped the area with a dry paper towel. I distressed the edges of the frame with my trusty FolkArt Layering Wood Block and Ceramcoat Acrylic Paint in Walnut Noyer. I also used the layering block to lightly distress the center areas of the frame. More information on the layering block is here in a previous post. I sealed my new farmhouse sign with Krylon Satin Finish Spray . The frame makes the piece special! It may seem like I spend a fortune on stencils, but I don't. I reuse them for gifts, for friends and family, and I sell a few. I doubt you will find this EXACT sign out there but USE your imagination. It's fun to create! Inexpensive stencils are readily available at Walmart and the chain craft stores. Combine these inexpensive stencils with an inventory of some special stencils, and you can create "boutique" quality projects from thrifted finds! Another great sign - haven't heard of a mesh stencil so appreciate the tutorial too. Love this redo! I like the hinges too, makes it so farmhouse!! WOW!!! I love how your sign turned out! 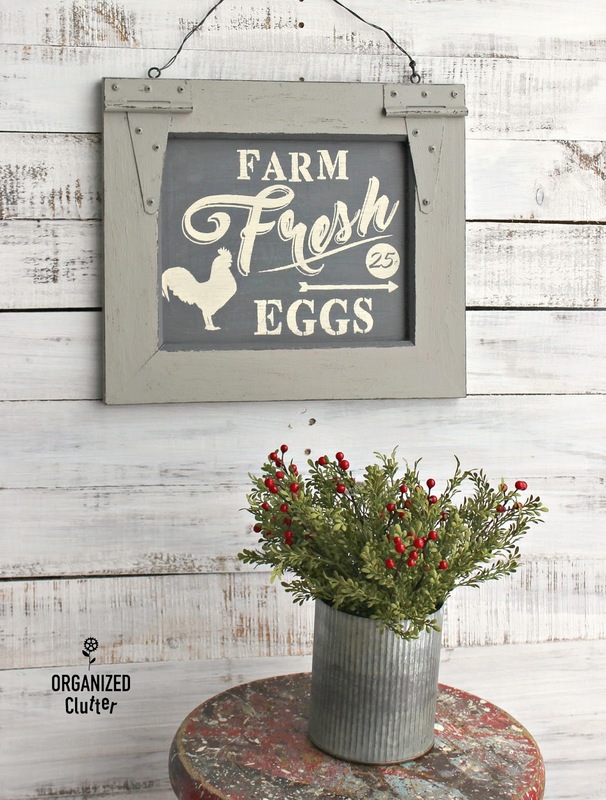 The stencil is wonderful and I love how you distressed the paint! This is so cute Carlene. You created another winner Carlene! I wouldn't have wanted the beer sign either, but love the frame now with the hinges.